CG's Twitter went home with Nick and Dominic today in Finneytown. Twitter has a new life and a new name, Nick is calling her IRIS! Greyt name for this sweet, delicate little girl. Nick and Dominic got to meet two females and both did really well. Outside Dominic showed off a bit running laps around his yard and both of the girls joined in the playtime. We went inside to talk a bit and Dominic laid on his bed, well this little girl laid right next to him. Nick said "Well I guess she picked us!" She is one of the tiniest greyhounds we've ever gotten and she even looks tinier next to big gorgous boy Dominic. He was thrilled to have another greyhound join his family. 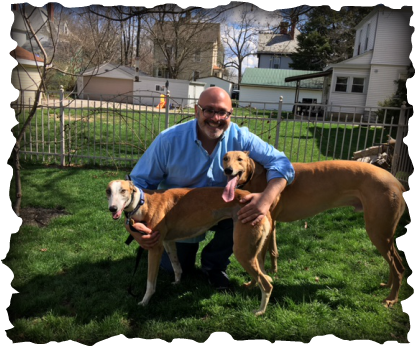 Nick has had several greyhounds and is a true GH lover!